Assistant Librarian - 1 Post - Basic Pay 15600 Academic Grade Pay 5400 in Pay Band III category - Bachelor's Degree in Library and Information Science ; Computer skills and English communication skills (written and spoken) is essential for this post - Age 35 years - This post will be filled in contract basis for one year, extension is applicable for well qualified candidates. Rs.100 for SC / ST / PwD / UIIC staff members. Rs.600 for OBC / UR candidates. Cut off date for educational qualification is 30th March 2016. CA Final passed in First Attempt. 4 Posts reserved for Orthopaedically Handicapped (OC) candidates. 1 Post reserved for Visually Impaired (VI) candidates. 1 Post reserved for Hearing Impaired (HH) candidates. Candidates should apply one post only. Selections through Group Discussion (GD) and Personal Interview. OBC will conduct the written test in-case of large quantity of applications received. 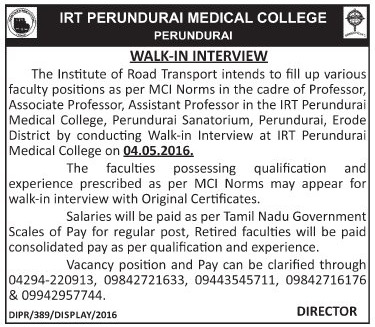 Walk in Interview venue IRT Perundurai Campus, Erode. Qualifications and Experience as per Medical Council of India (MCI) norms. 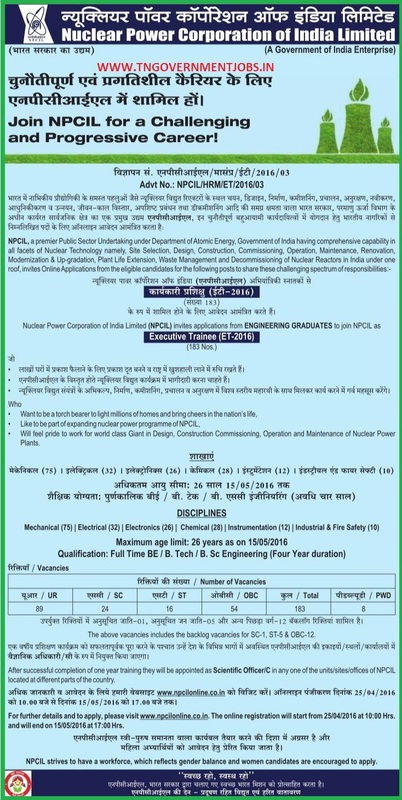 Retired persons can also apply for these posts. Govt of Tamil Nadu Scale of Pay will apply for direct recruitment candidates. Consolidated pay will be applicable for retired persons. 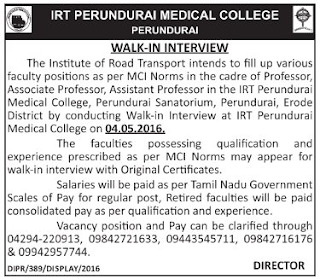 Walk in Interview venue : IRT Medical College Campus, Perundurai, Erode District, Tamilnadu. Interested and eligible candidates may apply through online application only. Examination will be held all major cities in India. UR Destitute Widow No age limit. Questions will be set in Tamil and English. Paper I : Library and Information Science in Degree Standard 200 MCQs each 1.5 marks Total 300 marks. Paper II : General Studies in Degree Standard 200 MCQs each 2 marks Total 200 marks. Examination will be held in Chennai only. Last date for online application 24th May, 2016. No Fee for SC / SCA / ST / PwD / Destitute Widow. Apply through online mode of application only. Age relaxations are applicable as per Government of Karnataka norms. Horizontal Reservation for PwD Quota : 1 Post UR applicable. Application Fee Rs.1000 for all others. There no application processing fee. High Court, Appellate Side, Calcutta. Maximum age limit 40 years. Apply through online or offline (Print format) application. After submission of online application, printout of application copy along with all necessary documents duly self attested to the following address by hand delivery only. Speed Post, Regd Post, Courier will not accepted. Application Fee Rs.100 for ST candidates. Application Fee Rs.150 for SC candidates. Important Instructions : After successful completion of one year training period candidates will be appointed as Scientific Officer 'C' designation with prescribed IDA scale of pay structure. Application Fee Rs.500 for all others. Application Fee Rs.100 for UR / OBC candidates. No fee for SC / ST / PwD / Women candidates.